Excellent air purifier with a superior gas filtration system to remove a wide range of chemical vapors. Especially good for asthma or chemical sensitivities, or if you live in a new house or have recently remodeled. 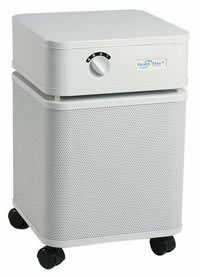 Every minute, the HealthMate + draws over 250 cubic feet of air through a 4-stage filter containing 15 pounds of Activated Carbon impregnated with Potassium Iodide and over 60 square feet of True Medical Grade HEPA. 2 pre-filters help to make the other filters last longer. If the HealthMate+ doesn't change your life and improve your sleep, return it for a refund within 30 days of purchase. Comes with wheels for easy portability. Cleans up to 1500 square feet with normal ceiling heights. Solid steel construction, powder-coated paint, energy saving motor. Comes with a 30 day money back guarantee and a 5 year warranty on all parts and labor, as well as a 5 year pro-rated filter guarantee. Austin Air was chosen by the U.S. Government to fulfill the largest deployment of air cleaners in American history and chosen by FEMA and The Red Cross to address the serious air quality concerns in post 9/11 New York. Made in the USA. Filters chemicals, mold spores, pollen, dust mites, tobacco smoke, pet dander, bacteria & viruses. Effectively cleans up to 1500 sq. ft.